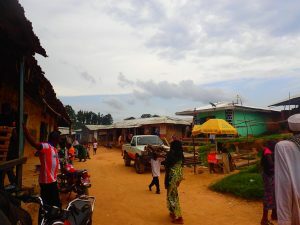 For the first time, residents of Konene village in Cameroon have access to electricity, thanks to the installation of solar panels that harness power from the sun. 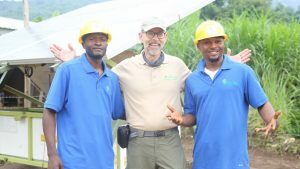 This clean energy project was completed through a partnership between Igniting Africa and IEEE Smart Village, and while it is transforming this rural African village, it also serves as a training ground for the young African men and women who completed the installation. 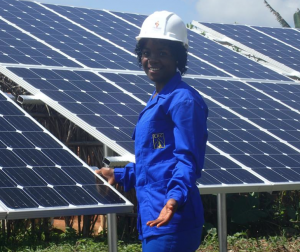 Led by two young engineers, Wawa Etienne and Ngeh Ernest, students of Igniting Africa’s School of Christian Social Entrepreneurship worked alongside their teachers to install the 10 kilowatt solar power system that now carries electricity to 20 homes. The team followed up with an extension to the village of Bua Bua, so it too could be connected. Michael Wilson, senior program manager for IEEE Smart Village, was in Cameroon to appraise the solar energy part of the work. IEEE Smart Village is a non-profit organization that provides locally-based energy solutions in underdeveloped parts of the world. The Konene solar project incorporates the key principles of the School of Christian Social Entrepreneurship by combining learning with doing, combining teaching with humanitarian work, and combining progress with love. 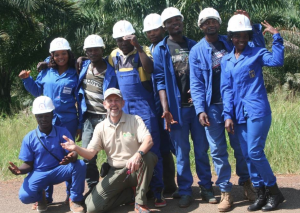 In keeping with Igniting Africa’s goal to improve communities from the bottom up instead of from the top down, the crew involved in this project is from Cameroon, teaching and learning from each other as they improve their own community. Inspired by faith, these young entrpreneurs worked tirelessly to provide a basic service and thereby improve the lives of the Konene villagers. Reaching the remote village presented its own set of challenges. 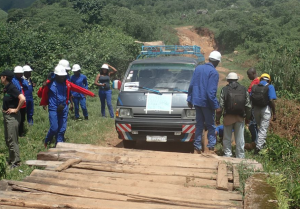 Equipment necessary for the solar installation was brought in by trucks and cars, but that became nearly impossible at times when roads were impassable. Rains washed away parts of the roads, and during drier conditions the roads were rocky and had deep ruts. But those challenges were actually a blessing, because they enabled the students to learn about problem solving, group dynamics, and community development at its most basic level. The School of Christian Social Entrepreneurship operates on a work-study model, where work is an integral and mandatory part of the educational process and allows students to attend school tuition-free. 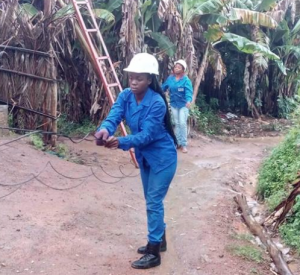 At the Konene installation, women worked alongside men, gaining valuable technical, engineering and community development skills. The School is always recruiting new students and teachers, and has begun to fundraise in the U.S. and abroad. With the Konene project now complete, Igniting Africa is prepared and energized, ready to duplicate this project and others in villages across Africa.